Start your meal with three mouth-watering curry puffs filled with our delectable Thai curry recipe. Curry Puffs are a favorite snack in Southeast Asia, including Thailand. Depending on the region, Curry Puffs could be filled with a variety of fillings. Thai Dee Restaurant uses carrots and potatoes in a fragrant Thai curry recipe. These are wonderful to share as an appetizer or enjoy as a dessert with an order of Thai Iced Tea or Thai Iced Coffee. 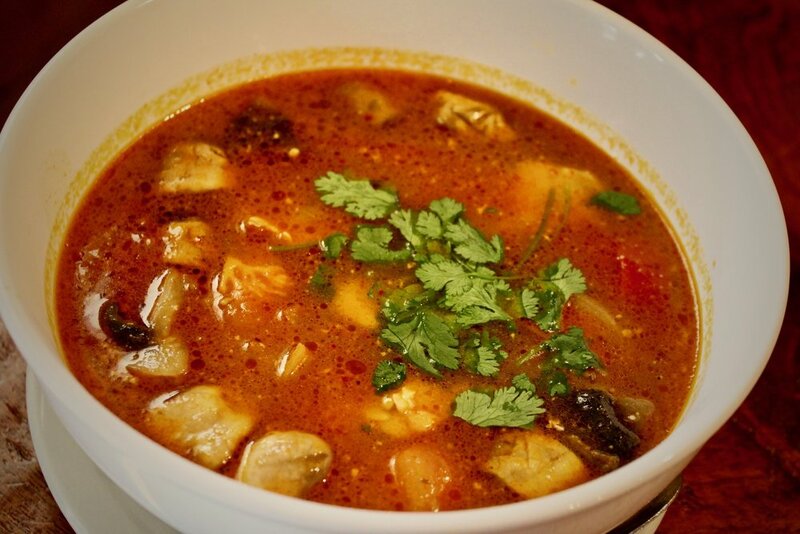 There are different legends behind the name of this classic Thai dish. In fact, there are many variations to the Tiger Cry name: Crying Tiger, Weeping Tiger, Tiger's Tear. 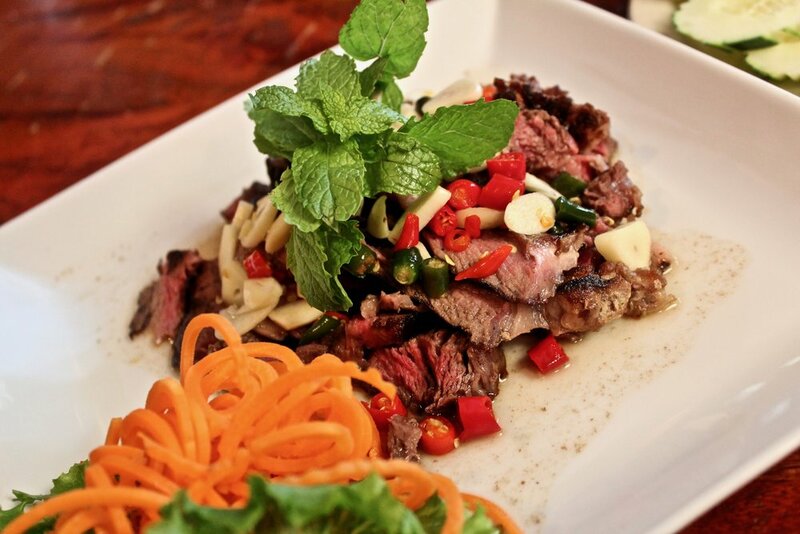 Savor the tender, juicy slices of rib-eye steak, with fresh garlic, Thai chilies in lime juice and fish sauce. Served with a side of fresh basil and cucumber. It pairs beautifully with an ice cold beer or red wine. Remember, if you're 21 and up you can BYOB. Treat yourself, friends, and family to an order of six Banana Spring Rolls with Coconut Ice Cream: caramelized crispy fried banana slices wrapped in a spring roll sheet, fried and drizzled with honey and topped with roasted, crushed peanuts, and paired with refreshing coconut ice cream. This will satisfy anyone's sweet tooth! Includes Two Vegetable Egg Rolls, Soup of the Day, and your choice of beef, chicken, or tofu. Spice level may be adjusted accordingly. All meat may be substituted for tofu. Add $4 for shrimp / Add $2 for pork. deep fried white tofu slices, served with spicy sweet and sour sauce, topped with ground peanuts. Spice level may be adjusted accordingly. All meat may be substituted for tofu. I didn’t graduate from a fancy culinary institute or go to business school. I did however, start my life in Thailand. I grew up around the popular street food in the heart of Thailand. From a very young age all the way up into my teens, I would go from restaurant to restaurant trying different dishes. I know about authentic Thai cuisine like the ones you find in Thai villages, and we serve some of the very same dishes in this restaurant. We always use the best quality ingredients in our recipes and we keep our menu delicious and healthy! I hope that our life experiences translate to a fine dining experience that you will love. Thai Dee is not just a restaurant but also a charitable family always eager to give back to the community. We have been working with Meals on Wheels for several years bringing warm food to people who need it the most. We accept Trinity University's The Tiger Card!